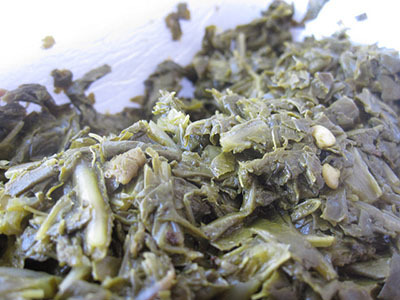 In 2007, the General Assembly designated the Ayden Collard Festival as the official State Collard Festival (Session Laws,2007, c. 28). The bill to make the Ayden Collard Festival the official Collard Festival of North Carolina was sponsored by Rep. Marian McLawhorn of Grifton. She stated that her fellow representatives were amused, but supportive of the bill. The bill passed unanimously in the House in March of 2007, and was approved by the Senate with a vote of 47 to 1 in April of 2007. The Ayden Collard Festival began in 1975 as a way to celebrate the end of the tobacco harvest. Town leaders wanted a fall festival but were unsure as to what kind, so they asked the citizens to vote on one of six names and themes selected for the potential event. ‘Collard Festival’ won by a large margin. According to legend, the idea to celebrate collards came from the teasing of a woman in the town who wrote an article in the local paper. In her article, she wrote about all the wonderful things the town had to offer, but kept coming back to the recurring phrase “… but I hate collards!” As a joke, the President of the Ayden Chamber of Commerce wrote a letter challenging her to head up a Collard festival. She accepted, the townspeople supported it, and the festival was born. The festival today is less associated with the tobacco schedule and is instead considered a way to reunite after the summer and commemorate the beginning of school. It is held the first week in September, from the Tuesday after Labor Day until Saturday. Popular events include the Collard parade, the Miss Ayden pageant, an art show, a talent show, and the collard eating contest. The festival also provides entertainment from local bands, as well as amusement rides and activity booths. The festival’s fame has spread beyond North Carolina. US Representative Charles Taylor reported in 2006 that when he would wear his Collard Festival t-shirt in Washington DC he would frequently be approached by strangers who had heard of or attended the festival, and even by some who wanted a similar shirt for themselves! Hochberg, Adam. "N.C. Town Cooks Up Yellow Cabbage Collards." NPR. June 05, 2009. Accessed July 13, 2017. http://www.npr.org/templates/story/story.php?storyId=104882982. Livingston, Ginger. "Ayden seeks greens credit," Daily Reflector, The (Greenville, NC), March 18, 2007. Collards. Image courtesy of Flickr user Mswine. Available from https://www.flickr.com/photos/melaniewong/5662851979/in/photolist-9CpAAX...(accessed July 13, 2017).